... and it's a very special one. My friends Cherie (Quilted Jonquil), Dar (Dar's Patchwork Garden) and Kevin (Kevin the Quilter) got together earlier this month to finish assembling the top. Because we had made the blocks slightly oversized and trimmed them down carefully, it went together very easily. We spent as much time yakking and eating, playing with Kevin's puppy, and taking photos, as we did sewing. 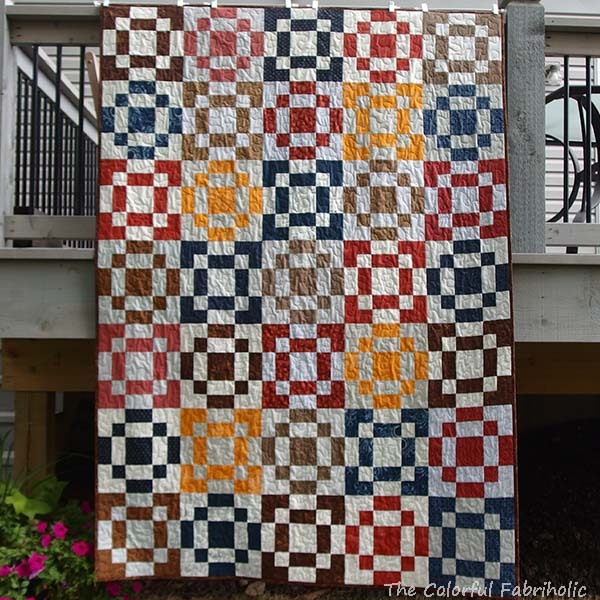 We have a backing for this quilt, which was donated by one of my friends in STLMQG. 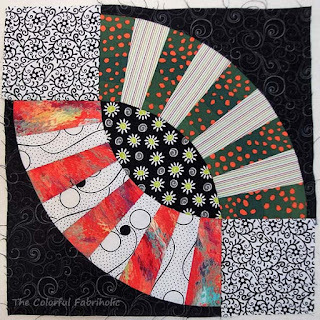 Cherie will quilt it for us on her long arm. Then she'll pass it to me and I'll bind it. 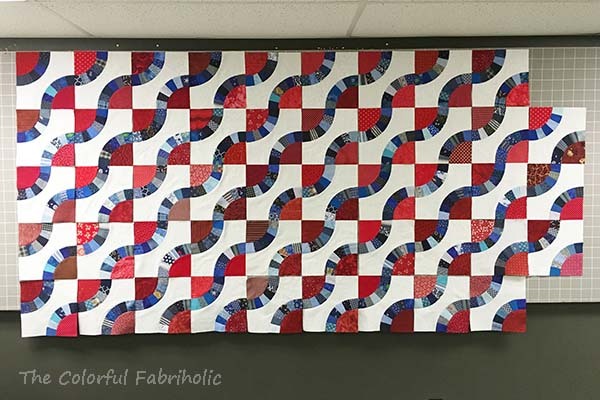 We auditioned binding fabrics and the winner is on the wall with the quilt top. This was a challenging project to make, so we really celebrated our finish. We got together four times over 2017 to work on it. Totally worth all the effort! And as you can see, we had fun along the way. 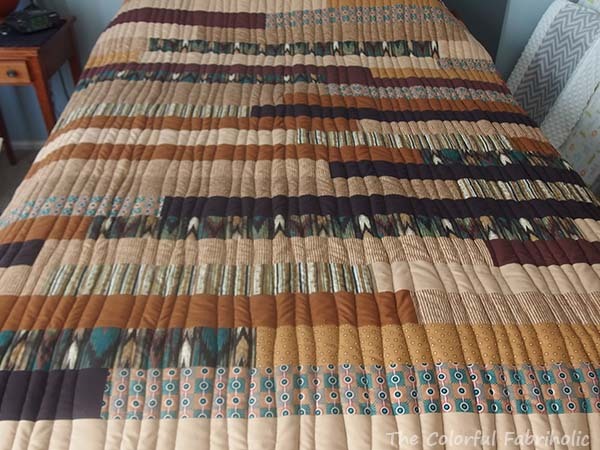 Our snake quilt has always been intended as a Quilt of Valor. 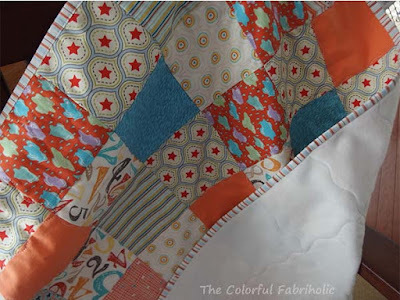 We have a recipient in mind, and we'll work out the logistics for a presentation after it's all quilted and finished. We plan to continue to get together to make Quilts of Valor, and Kevin has an idea for our next project. I'm looking forward to getting together with these friends in 2018. 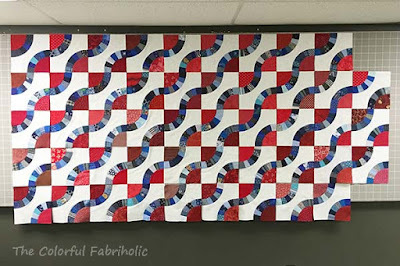 Linking up with Whoop Whoop Friday over at Confessions of a Fabric Addict because finishing our snake quilt flimsy is certainly worth celebrating! 1. 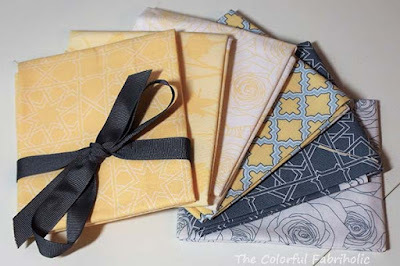 Use at least as much stash fabric as newly acquired fabric. Yes, I used over 17 yards more than I acquired in 2017. 2. Complete at least four donation quilts (or tops for Heart Builders). 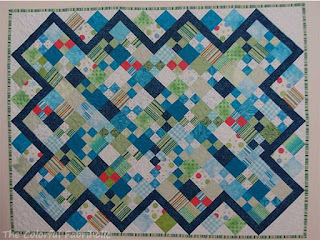 Yes - Completed two quilts for Hands2Help, and three for Project Linus. Also made three Little Dresses for Africa for STLMQG and 10 pillowcases for Hurricane Harvey relief. 3. Log WIPs and UFOs and finish as many on the list as possible. Or if appropriate, get rid of any project that I know I'll never finish. Completed 6 WIPS that were started in 2016 and 2017 and one UFO from 2015. Added more new WIPS to the list. Still have 7 UFOs from 2016 or earlier. 4. Participate in Hands 2 Help. 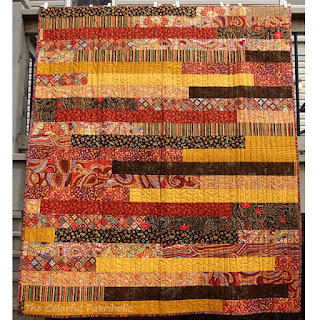 Yes, I provided two quilts to the International Institute of St. Louis, "Welcome Home" and a modified race quilt. 5. Participate in 12 Days of Christmas in July blog hop. 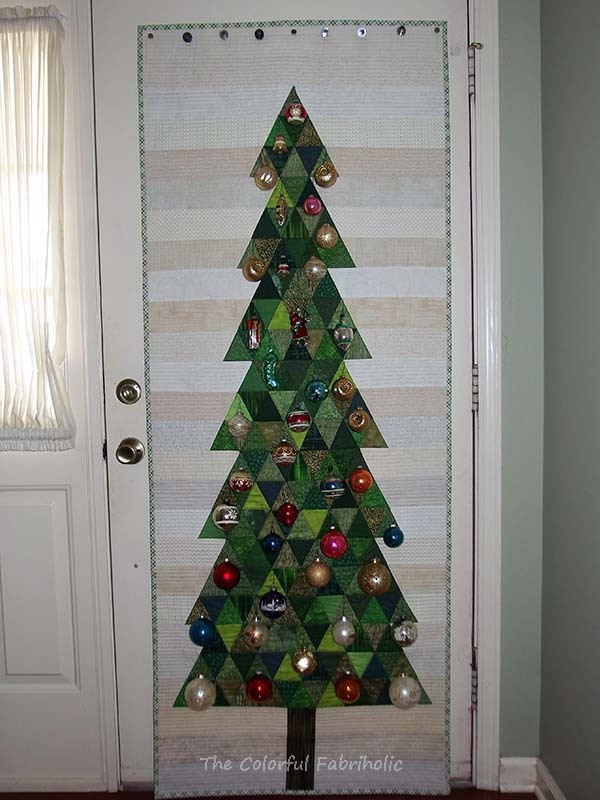 Yes - Created a Christmas Tree wall hanging at my son's request and posted a tutorial for it. 6. Blog at least twice a week; continue posting monthly goals and stash reports because they keep me focused and accountable. Yes, most weeks I posted two or three times a week. 7. Design a block for FabriQuilt or other new block design blog hop. No, didn't do this, but wrote a tutorial for the existing Propeller Block so my bee friends could use it to make blocks for me. 8. 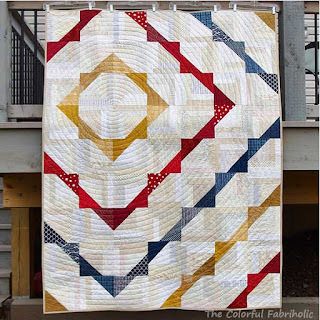 Publish at least one new pattern. 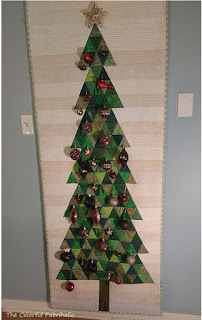 Did not publish a stand-alone pattern for sale, but published several tutorials on the blog: Snake Block with Templates, Machine Binding with Glue Basting, Christmas Tree Wall Hanging, Scrappy Nine-Patch Stars QOV. Can 2018 top that? Several of my 2017 projects were donation quilts, dresses, and pillowcases. 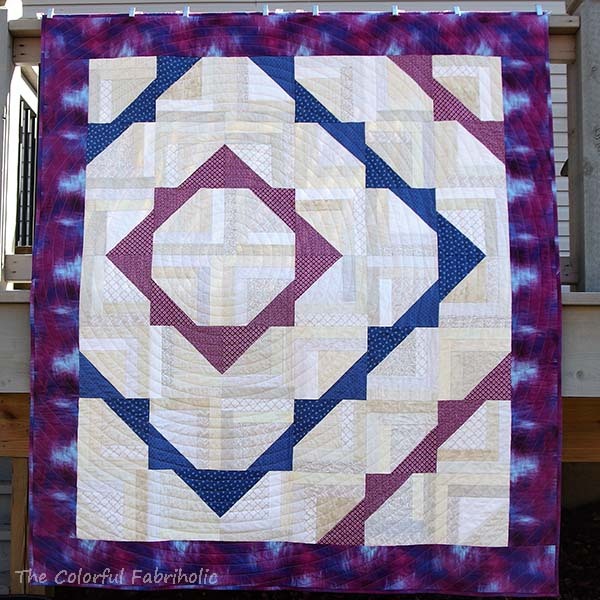 In addition, I made and gave a quilt for my SIL to give to her friend in a remote village in northern Alaska. 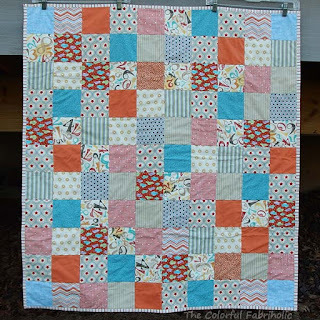 I also made a comfort quilt for my brother when he was having health issues. 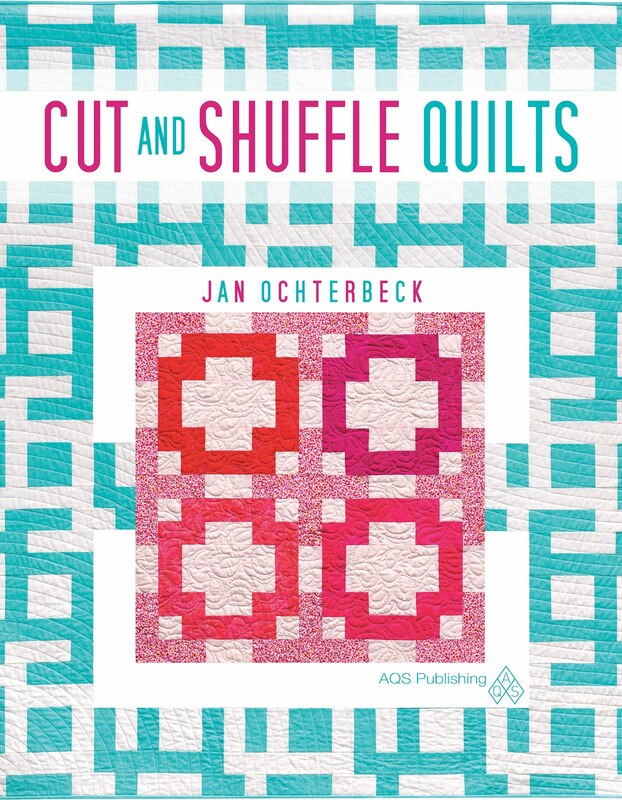 I would like to continue the donation theme in 2018, partly for the pleasure of using stash and the enjoyment of making quilts, and also because we really don't need more quilts around here. 1. Use (or give away) at least as much fabric as I bring into the stash. 2. Blog at least twice a week; continue posting monthly goals and stash reports because they keep me focused and accountable. 3. Piece and/or quilt one donation quilt per month for a total of 10 donation quilts for the year. Could be in conjunction with other charity projects such as guild or H2H. 4. 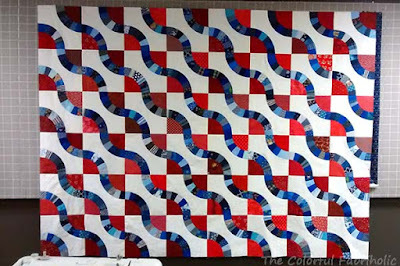 Red Project: continue working on this as a BOM to a completed flimsy, then get it on a long-armer's list for quilting. 5. 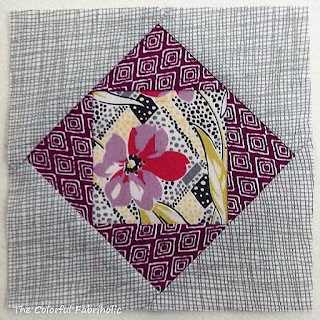 Pickle Dish: continue working on blocks and progress to a completed flimsy, then get it on a long-armer's list for quilting. 6. 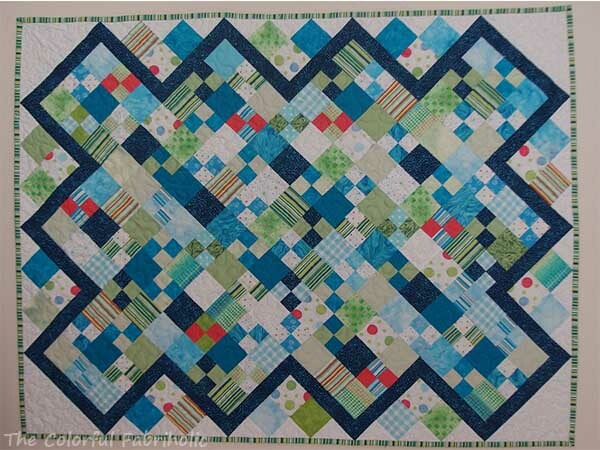 Finish Roman Road UFO to a flimsy and get it quilted. 7. Review list of UFOs and determine whether to keep & finish or get rid of each one. Finish at least two of the projects on the list. 8. 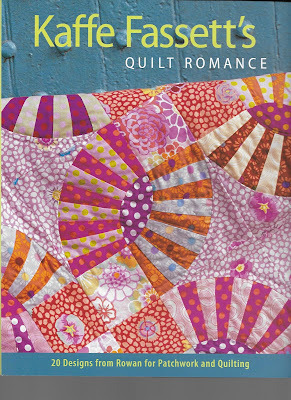 Send unquilted donation tops to someone who can/is willing to quilt and donate them. 10. Post at least two new tutorials. I also want to say a big thank you to all of you who have been with me so far on this quilting & blogging journey. You always have good advice for me when I ask. 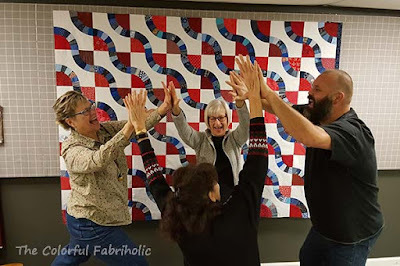 Your visits and your comments mean a lot to me and I enjoy connecting with and being a part of the larger quilting community. My son and his housemates have put up the Christmas Tree hanging I made for them. The story of making the tree is here. He sent photos. 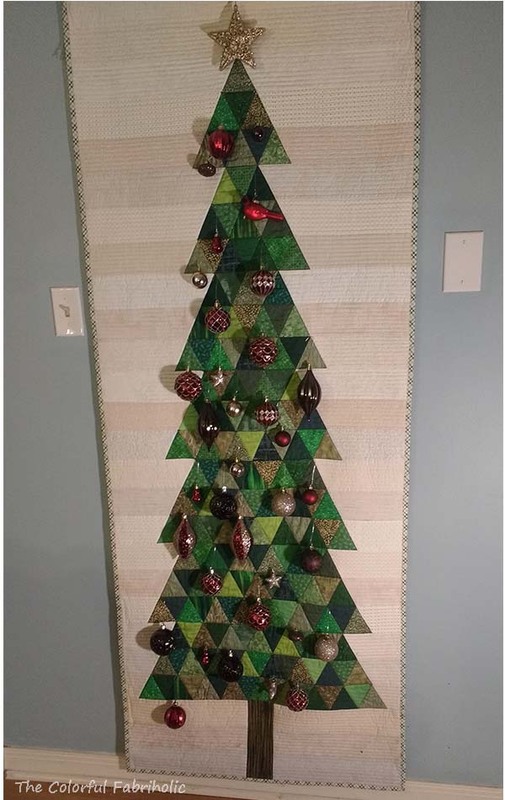 He says the tree is great for the space they have and the place where it's hanging, but it's hard to get a good photo of it. I think his photos are great. 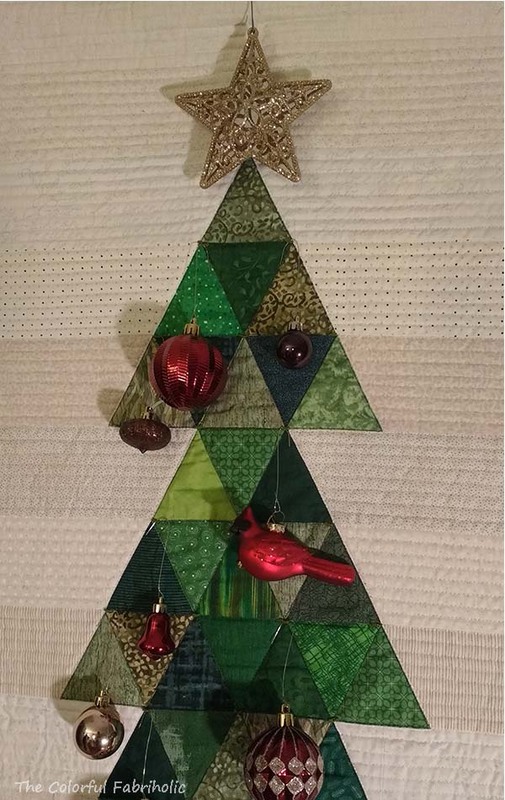 See that cardinal ornament? We took my son and little grandson to Silver Dollar City in Branson to see the Christmas lights a couple weeks ago, and we each got one of those cardinal ornaments while we were there, so I have one on my tree too for the little guy to find. We're looking forward to a few days with the guys here next weekend. Grandpa has been busy assembling a train board. My sewing room has been converted to gift wrapping mode, so no sewing will be happening in there this week. I'm going to take a few days off from blogging to enjoy the holiday preparations and Christmas with my family. I wish you all a merry Christmas, happy Hanukah, and blessings of the season. I'm still working on paper piecing the arcs for my Pickle Dish quilt. This week has been busy with Christmas preparations, etc. but I found enough sewing time to get another set of coral arcs, two sets of turquoise ones, and two sets of yellow ones done. The lightest coral ones replace some that were too dark. Each set of four arcs makes a ring. The big bunch of coral ones banded together at the back is 16 arcs, which will go near the outer edge of my layout. I've ordered Kelp green Grunge for the remaining sets. Thanks, Yvonne, for your help to identify the Grunge color. 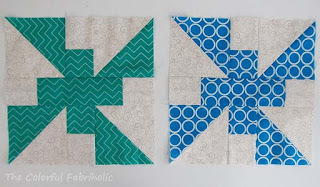 I'll make the green arcs before I start assembling the blocks because I want to play with laying the colors out on the design wall. I have to do that before the blocks are assembled in order to determine which two colors get paired up into one block. I've been working on the arcs in sets of four at a time, chain piecing them. There are 8 seams per arc. 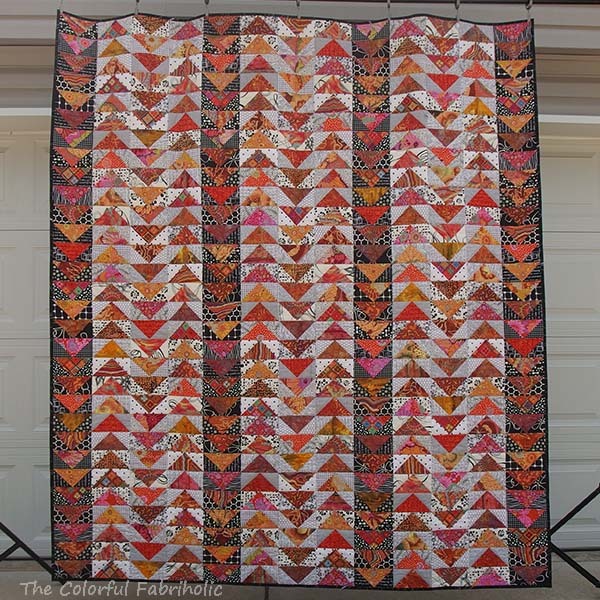 Even with chain piecing, that's a lot of stops and starts, so I've been leader/endering another donation top. 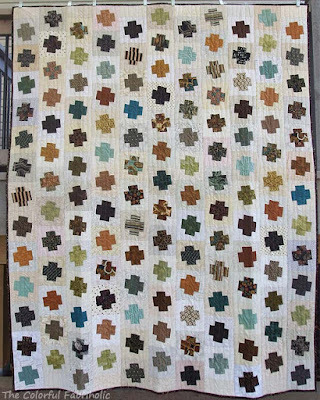 Between last week and this week it got to the point where almost all of the patches were sewn into rows, so I couldn't resist sewing the rows together and finishing it. 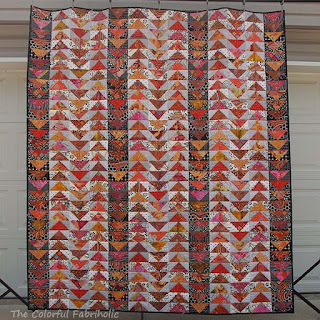 If these colors and fabrics look familiar, it's because some of them were used in my Broken Chevron quilt, and I still love the color combo. 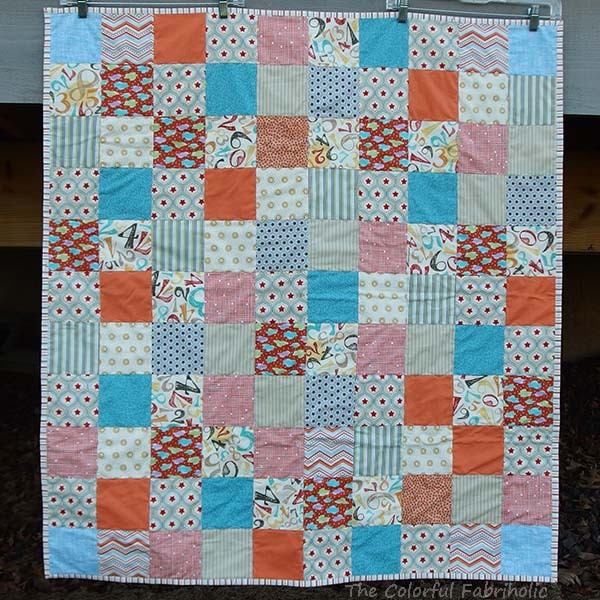 As is, this top is 40 x 44" but it's kind of sophisticated for a baby quilt. 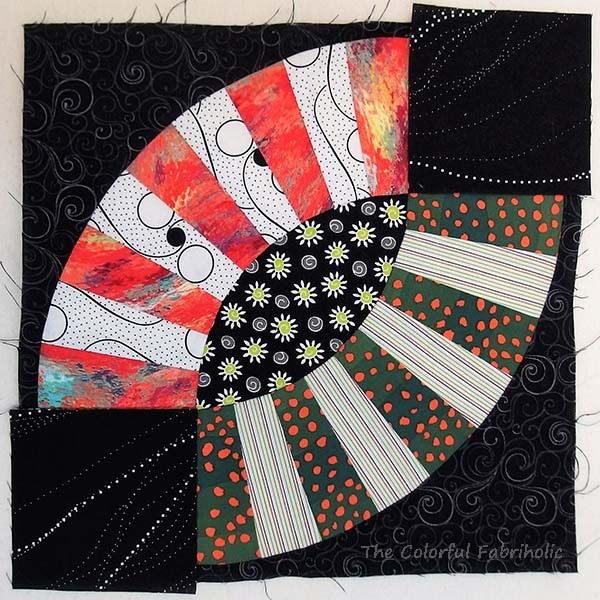 I'm debating whether to leave it as is or see if I have enough of anything in my stash for a border to enlarge it. What do you think? Back in October I worked on some little Economy Blocks for a secret project. The secret project has been presented, so now I can show my blocks. These became part of a quilt which was presented to the outgoing founder and president of STLMQG. Last Saturday was her last meeting as president, and this beautiful quilt was presented to her. It's clearly a case where the whole is greater than the sum of its parts. On Saturday STLMQG held their December meeting which is always a ticket raffle, a fun event and a fund raiser for the guild. Members donate desirable items and/or purchase tickets, then drop tickets into the bag corresponding to the item they want to win. I contributed an item and purchased $10 worth of tickets, so I had 40 tickets to spend. Last year I didn't win anything. This year sure made up for that!!! Everyone wanted this sign made by Marie, and I'm the lucky winner. 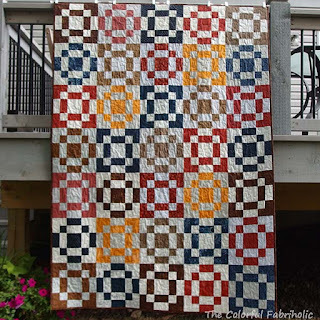 This will look great on the wall in my sewing room. Thank you, Marie! 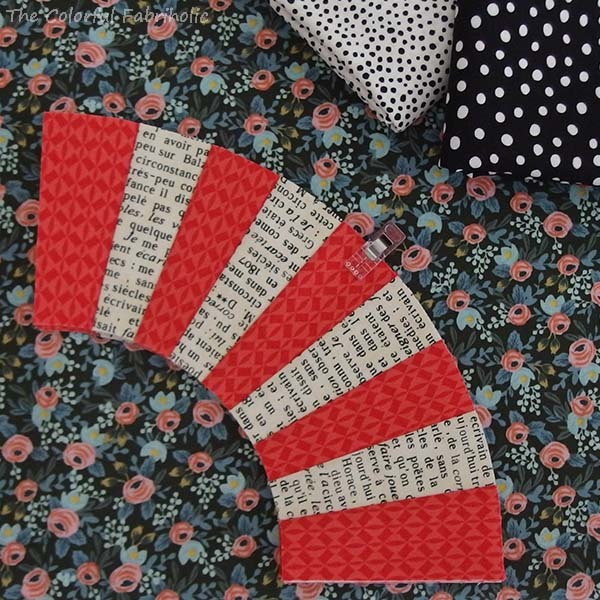 I also won a FQ bundle of Casey York's new fabric line, Fine Spun Volume 1. 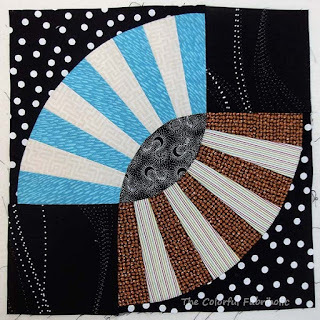 Casey is a very talented member of STLMQG and the author of Modern Applique Illusions and The Applique Book: Traditional Techniques, Modern Style. 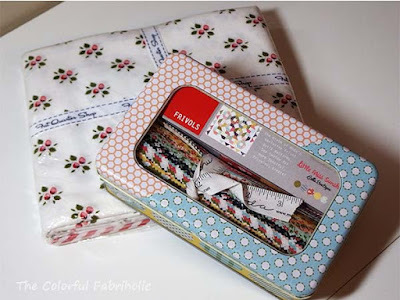 There were several Moda Frivol kits offered and I won one of them, complete with finishing kit. This one features the Little Miss Sunshine line. The tin contains a pattern and enough 7" pre-cut squares to make the blocks for a small quilt. After the meeting my bee went to lunch and had our group Christmas party. So much fun; we missed those who weren't able to be there. 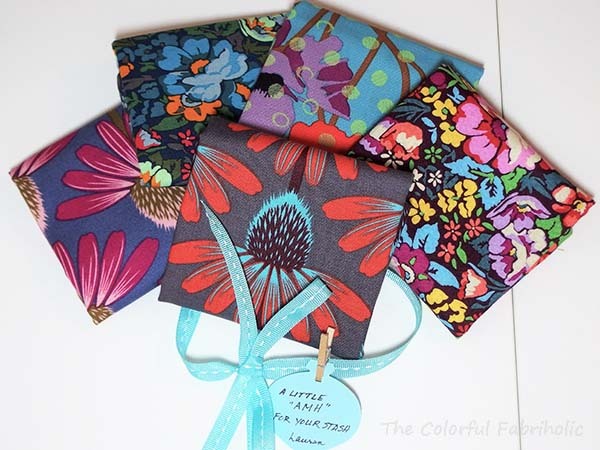 In the gift exchange I received this lovely AMH bundle of FQs from Lauren. I love it - such rich colors - and that coneflower print is a favorite! Thanks, Lauren! Truly my lucky day! This adds up to 10-7/8 yards going into my stash. I'm grateful to those who donated these items and happy to have won them. Back in October STLMQG had their retreat which included the popular Scrap Scramble, in which we dumped our baggies of scraps into a huge pile and scrambled to refill the bags with new-to-us scraps. 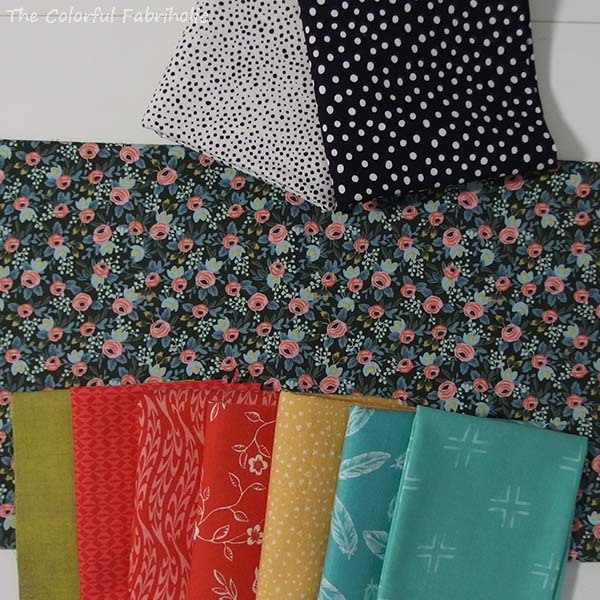 I nabbed some cute prints that happened to coordinate with some other scraps, leftovers, and FQs in my own stash. The result was a quick little top for a donation quilt. 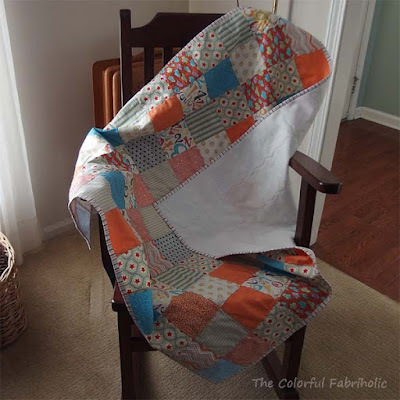 The little donation blankie is now quilted and bound and ready to give comfort to a small child. Instead of batting and backing, I used one layer of polar fleece, and quilted it with serpentine stitching along the seams. 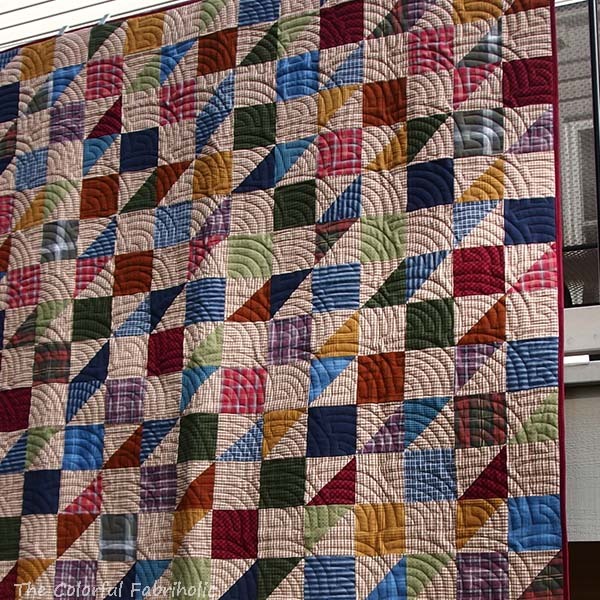 The result is soft and snuggly, and it measures 40" x 44". 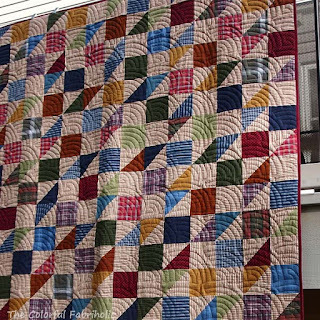 Since it technically doesn't meet the definition of a quilt, I'm calling it a blankie, which is exactly how it'll be used. 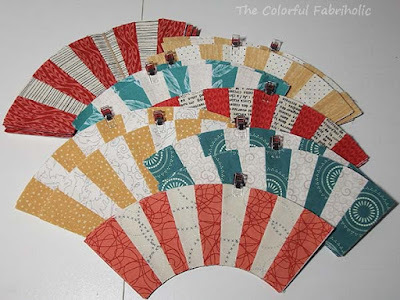 I see more of these in my future - a good way to use up scraps and stash, and a quick, easy, and less expensive way to finish a charity project for donation. I may set a goal of making one each month in 2018. Anyone care to join me? I'll wait until the charity projects of the guilds I belong to are announced for 2018 and see if this blankie can be included. If not, I'll give it to Project Linus. I've been deluged with spam lately. I've turned word verification on, but some of the offenders are still getting through. Same message posted as comments to random old blog posts, multiple times a day. I've notified Blogger about the problem, even named the offenders, but so far no reply from Blogger. I love legitimate comments. I'm so sorry to have to use word verification; I know no one likes it. I can tell it's cut down on real comments from actual readers. I hope you'll bear with me until the spam problem goes away and I can turn word verification off. I really love to hear from you. 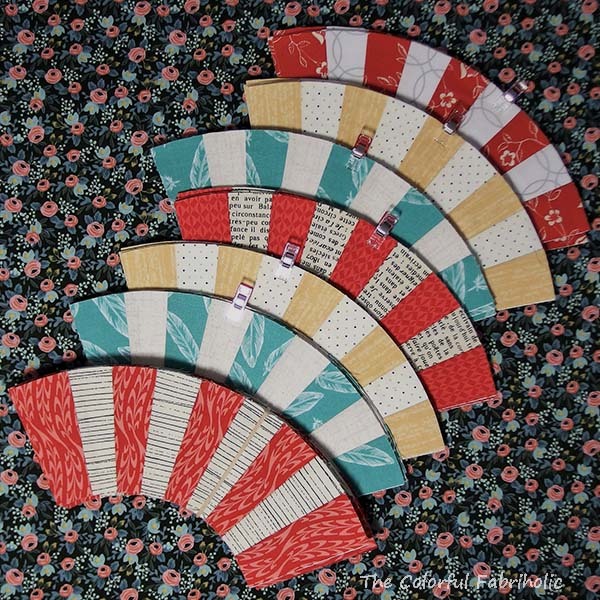 In much happier news, I'm progressing with paper pieced arcs for my Pickle Dish project. There are four arcs in each clipped batch, and 16 arcs in the banded batch. I have 8 more of yellow #2, 8 more of aqua #2, and 16 green ones to go. Still searching for the right green fabrics. I might replace the darkest coral ones (at top) with a lighter coral shade. I only need four of them, so it won't be a problem to remake them. ...a few days late, but I want to recap November for the record. It was a pretty good month. YTD Net Change: 30-1/2 yards OUT. Whoo-hoo! 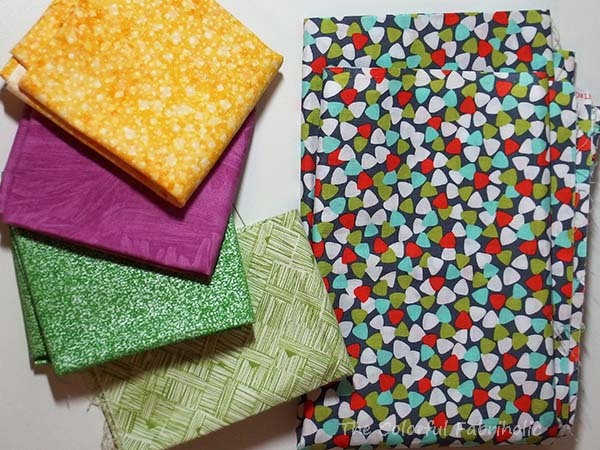 It's been a good year for using stash, but I'm also purchasing new fabrics when needed. 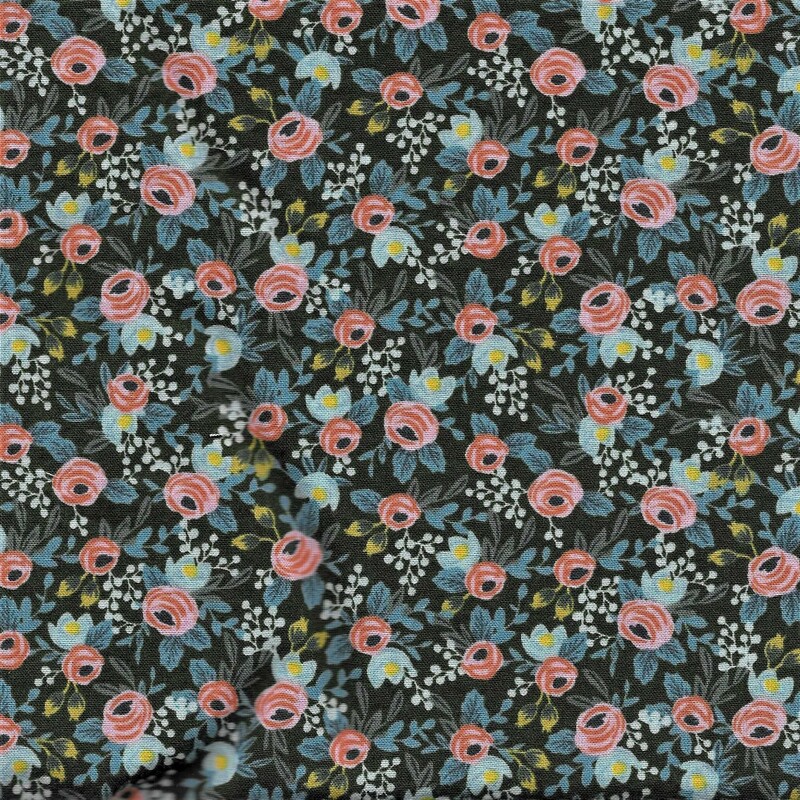 Finding the border print fabric for the original LCT top back in September really helped move that project along to a finish this month, which boosted the yardage out numbers nicely. 3. Make one Dresden block and one Checkerboard block for the red project. DONE - actually made two of each. 4. Add borders to Original LCT top. DONE - not only finished the top, but got it layered, basted, spiral quilted, and bound. 5. Work on WIVSP hand piecing project. Yes - Spent about an hour total over several sessions; accomplished about 2/3 of a row. 7. Keep up with bee blocks. DONE. 8. Work on improv project from Jean Wells book. No. read through the first chapter again. This is so far outside my comfort zone that I'm not going to pursue it any more. 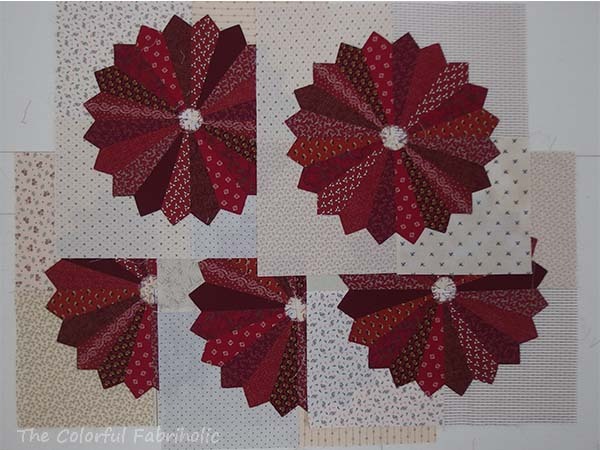 Other: Made test blocks, selected fabric palette, and started paper piecing for Pickle Dish project. With all the holiday stuff going on this month I won't have much time for sewing, so I want to limit my goals to moving WIPs and UFOs forward. 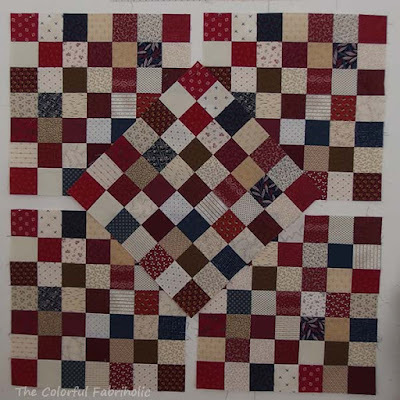 The only planned new project will be a leader/ender donation quilt, because I need leaders and enders as I paper piece the arcs for the Pickle Dish project. Even so, I think I'll have plenty to keep me busy! My "Alternative First Saturday" friends won't be getting together tomorrow - everyone has stuff going on - but here's proof I have my blocks done! Two Dresdens and two checkerboards completed in November, for a total of five each. After lots of playing in EQ7, I selected a dense floral for the background of my Pickle Dish project, and coral, aqua, olive, and soft gold for the accent colors. Armed with the EQ print-out, I went shopping. The background print is Menagerie from Rifle Paper Co, which has a deep hunter green ground. 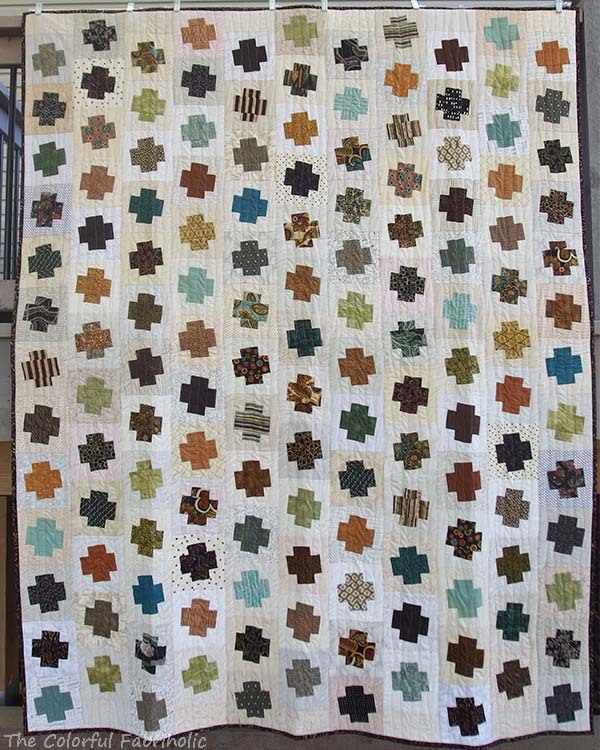 Some of the accent colors came from stash, others are new, so my stash report will take a hit this month. The olive is a placeholder, a scrap from stash. It's the perfect shade of Grunge which I bought locally a couple years ago, but none of the local shops have this shade now and I don't know the color number. I'll have to search for something that will work. 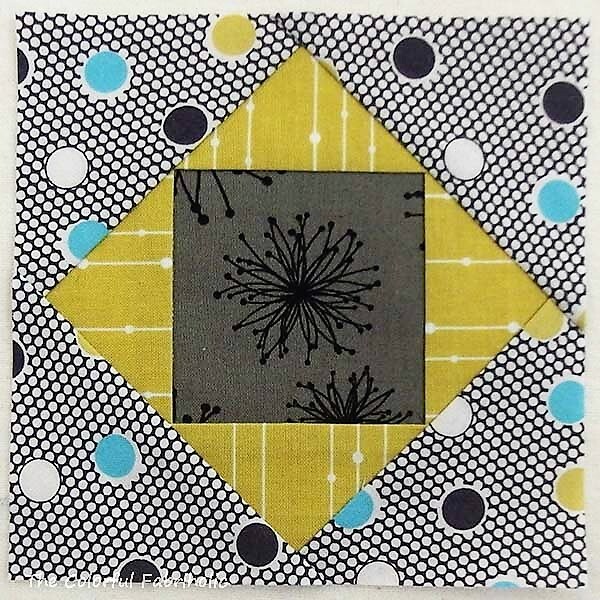 The black & off-white dotty prints are for the corner squares. I'm also using a variety of low-volume neutrals are from stash. This will be a long term project. 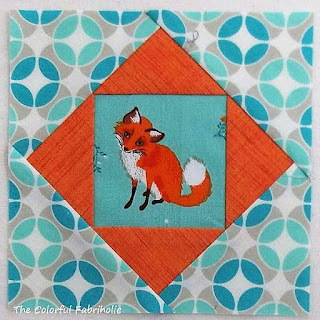 My plan is to paper piece all the arcs, cut all the background pieces (scissors cut from templates), lay out the parts on the design wall, and confirm the color placement before I actually put blocks together, because once the colors are paired up and sewn into a block, I can't move them around. So I've been paper piecing arcs, in batches of four so I can chain piece. Four arcs make a ring, so it's working out well so far. There's 8 seams per arc and I'll need 72 arcs. Even with chain piecing four arcs at a time, that's a lot of starts and stops. When I made the test blocks a couple weeks ago, I was only making one or two arcs at a time, also a lot of starts and stops. That's a lot of leaders and enders. 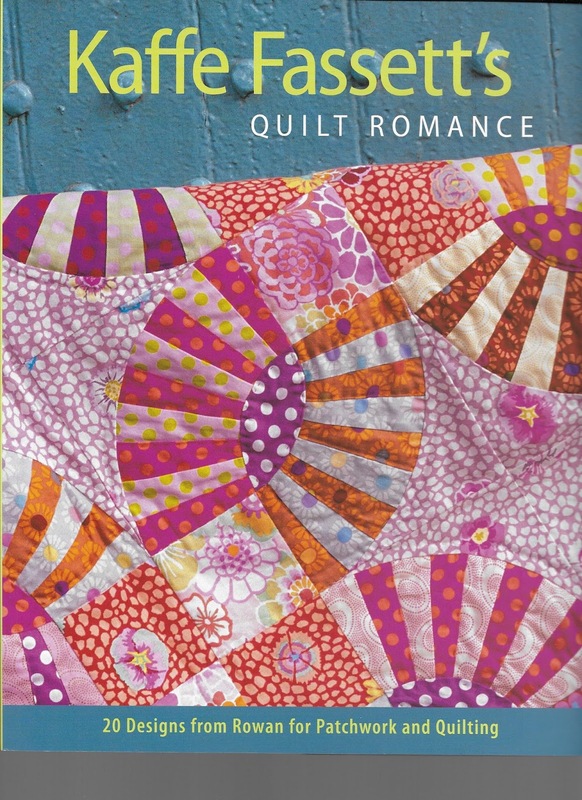 One of my goals this month is to use up some stash for a donation quilt top. 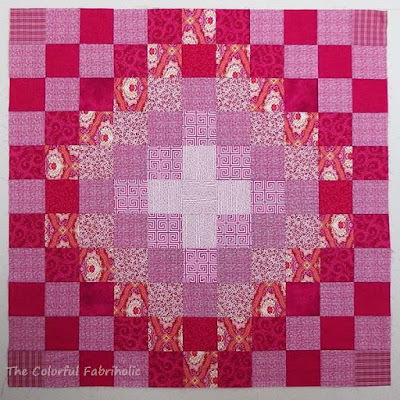 Earlier I had cut squares of a lot of pinks. This helped get rid of some partial FQs and some scraps, and I also cut strips from yardage. After laying out the squares on the design wall, I clipped them together so I could use them for leader/enders. A few dozen arc seams later, I had all the patches sewn into rows for this little donation top. 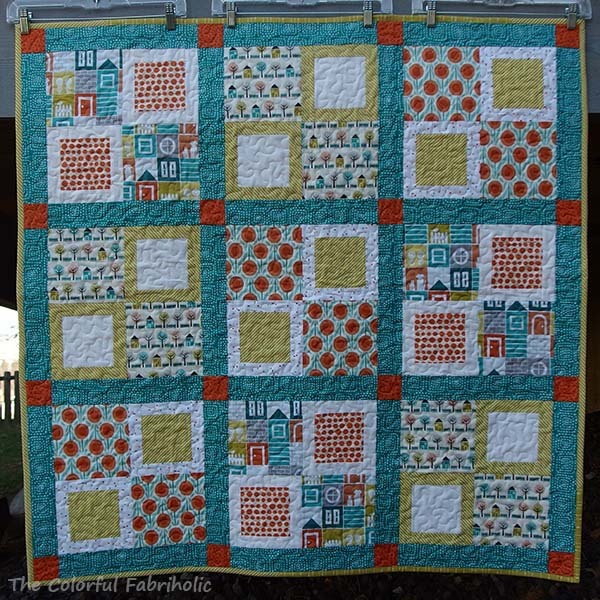 Then it was simple to just sew the rows together and get it finished. It's 44" square. It hardly made a dent in my stash, but that's OK. 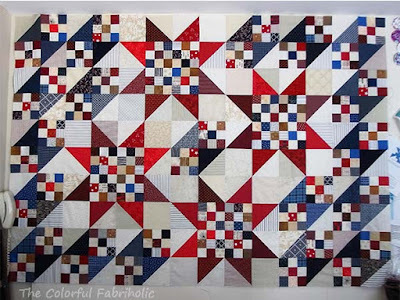 I'll cut some more squares for another donation top and continue to use them as leader/enders as I continue piecing the arcs for the Pickle Dish project. 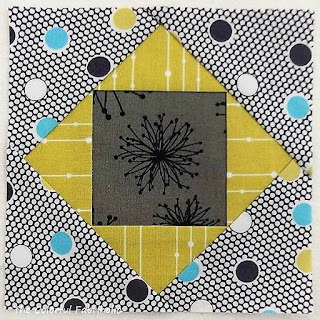 So since I have this little top finished, I'm linking up with Friday Finish at Crazy Mom Quilts and Whoop Whoop Friday at Confessions of a Fabric Addict. In my last post I talked about my plans for a Pickle Dish quilt and my concern about the proportions within the block. 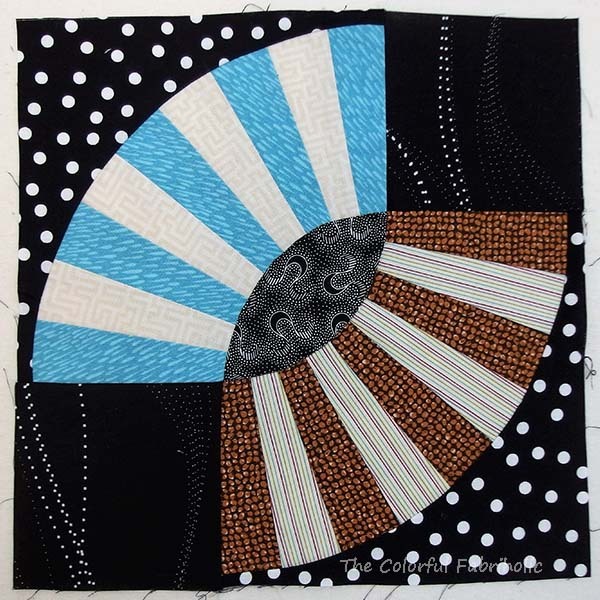 Now that I'm satisfied with the block pattern, I'm playing around with fabrics and colorings in EQ7. I originally thought I wanted mostly black & white prints with colors for only the eyelashes, but I haven't been happy with anything using that combo so far. This will be a long term project, a challenging one. This is not an easy block to construct; it's actually harder than the snake block. Stay tuned, and I'll keep you posted on progress. 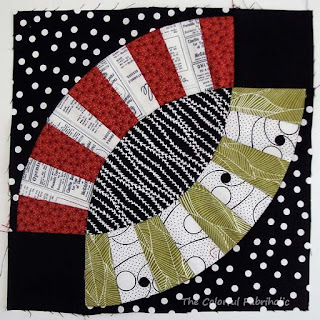 Ever since my friends and I have been working on the snake quilt* and Cherie taught me how to paper piece the arcs, I've been wanting to make a Pickle Dish quilt. So I played around and drafted a block. Um, no, I don't think so. 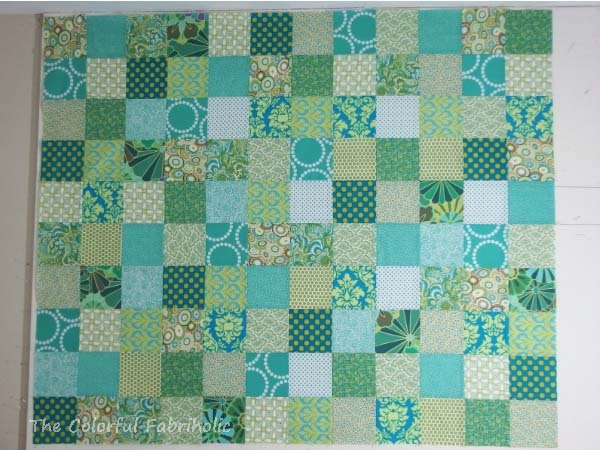 For a 10" block, I started with 2-1/2" squares in the corners which makes the arcs 2-1/2" wide. 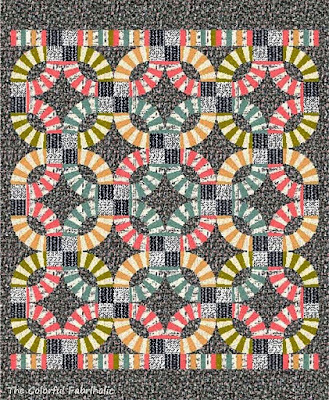 There's too much "eye" in the center. 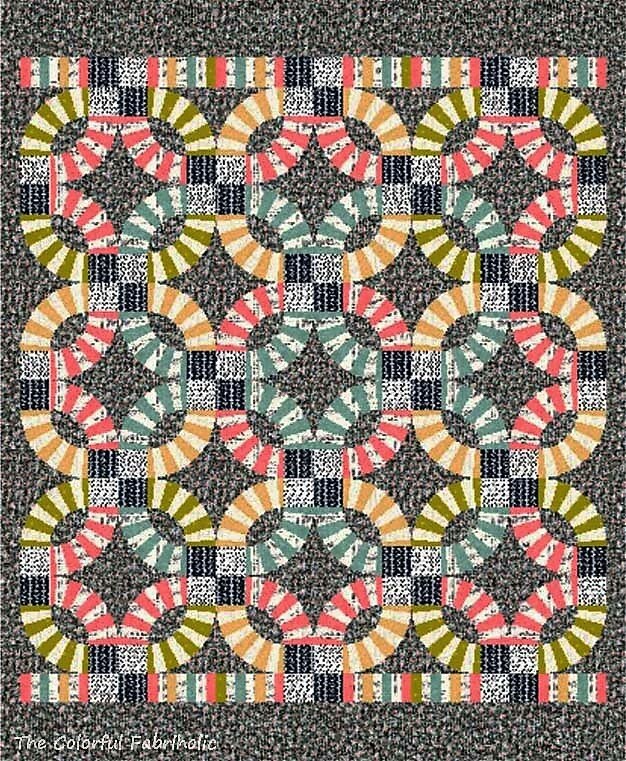 I might as well just use a standard Double Wedding Ring pattern for an effect like this. 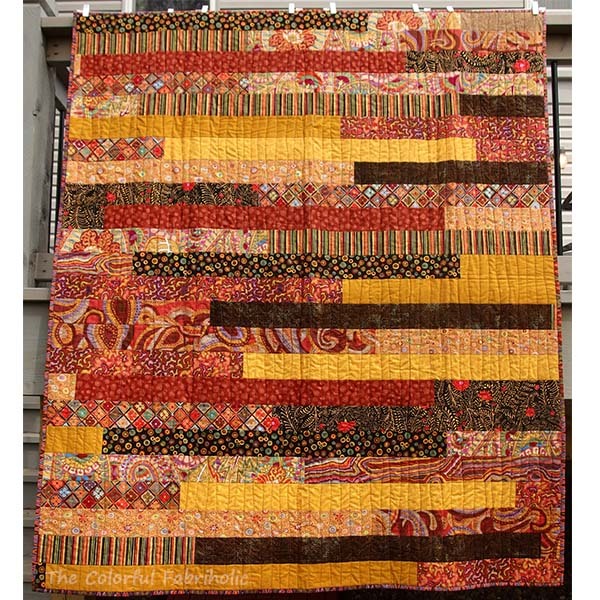 So I looked at pickle dish & similar quilts on Pinterest. 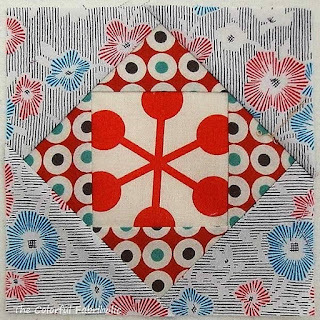 Many use Kaffe Fasset's pattern, so I ordered the book. And made another test block using their pattern. 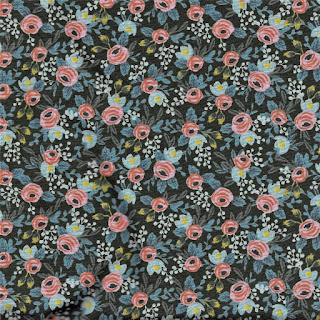 I have the utmost respect for Kaffe Fasset and his pattern design team. 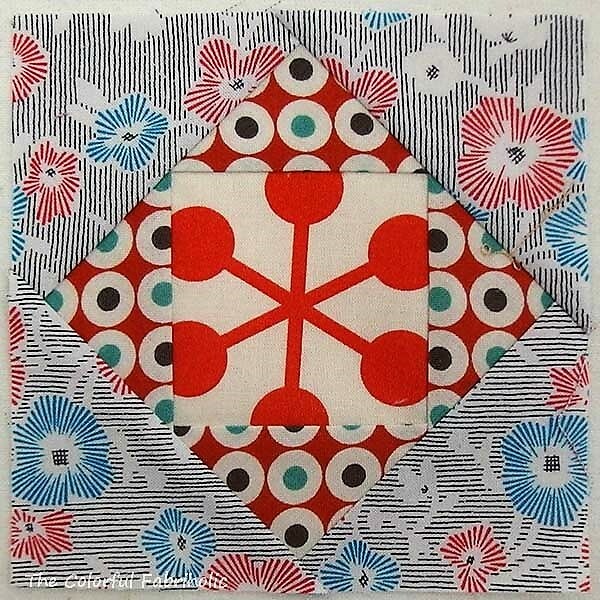 But to my eyes, it looks like too much eyelash and a beady little eye, with big heavy 3-1/2" squares in the corners. 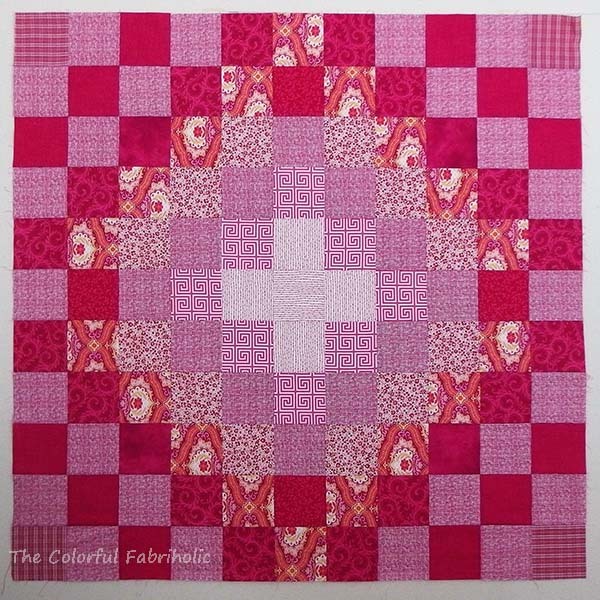 In his pastel version with low contrast prints, featuring those prints in large corner squares makes sense. But I'm thinking of using black & white prints for my corners, high contrast, so such large corners feel overwhelming to me, especially for the small size of the eye. So I tried again, and I drafted a version with 3" finished corners, halfway between my first attempt and the KF pattern. 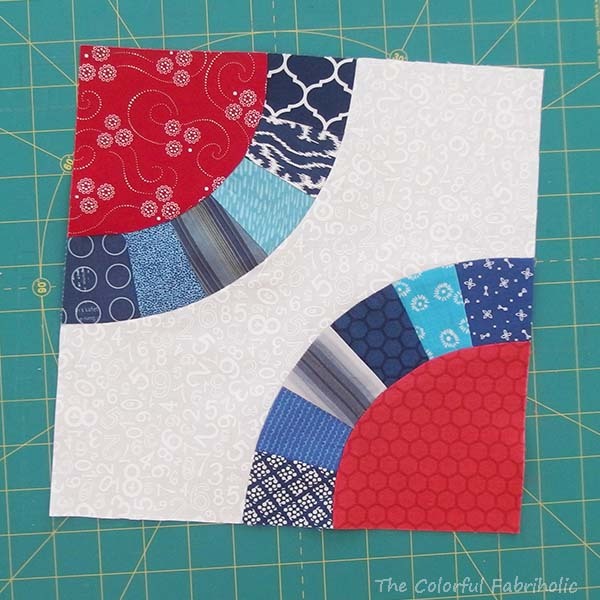 Knowing that some corner squaress will be light and some will be dark, I used light scraps for this test block's corners. OK, I'm liking the proportion better. Personal taste. No disrespect toward the KF design team intended. But are the light corners influencing my reaction? Let's look at it with dark corners. Let's look at them all together on my design wall. I'm satisfied with the 3rd version, medium eye and medium corner squares. 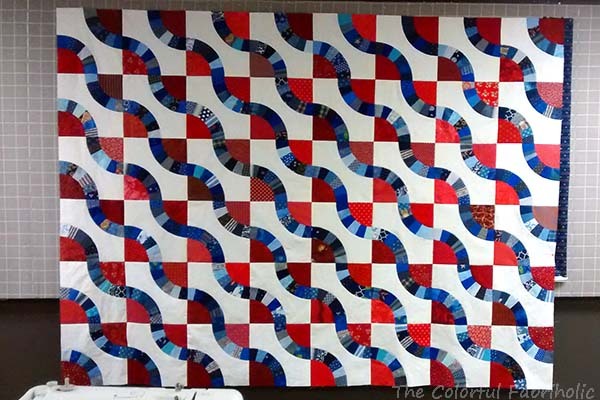 *About that snake quilt - the blocks are done but we're still trying to coordinate our schedules so we can get together for another sew day to get the top finished.